"I know some people get bored, but I don't know what it means! There's always something to do... cut the pages of a book, do crossword puzzles, take notes... always something to do! I'd like a 30-hour day because I am never bored! I wish I were 60. I'd only need 5 hours sleep! I'm going to the toilet." In this fourth installment of Fran�ois Truffaut's "Antoine Doinel" series, our young man (L�aud) is married and about to become a father himself. His wife, Christine (Jade), is now a violin teacher and the couple blissfully struggle with obstacles common to all young marriages. Our neglected and misunderstood delinquent of The 400 Blows (Les Quatre cents coups) seems now to have the attention he so desperately desired in his youth: a devoted wife, the parental support of his in-laws, the affection of all who know him. What can be wanting? The maturity to recognize these gifts and the responsible nature to accept them. Christine: What are you reading? Le Femme Japonaise? Antoine: I need it for my work. Domicile conjugal (Bed & Board—another sorry translation) is a fairly lighthearted comedy that belies the arrogant and restless nature that still possesses Doinel. With everything in place, he mucks it up by falling in with Kyoko (Berghauer), a Japanese woman he meets at his new job for a large, American corporation—a position he stumbles into as with everything else. This clash of cultures provides ample room for comedy, if only Antoine's consequences weren't so dire. Christine has grown up too—matured into her role as wife and mother, still girlishly in love with her impetuous young man. Will she forgive him? Will Antoine ever grow up? Early in the story, Antoine works for a florist right in the courtyard of their apartment building and there are some comical vignettes with the various inhabitants, including a cameo by Jacques Tati. Although humor flows throughout the film, after Christine discovers Antoine's affair the laughs becomes more subdued. As in Stolen Kisses (Basiers volés), Claude Jade balances a playful seriousness that anchors her less polished partner. Léaud is still lovable, in that incorrigible way men who never grow up seem to use to best advantage. In the end it is Truffaut's film. While stylistically rough, he has lost the edginess that rocked the world just a decade before and sinks his hands deep into the fertile soil of sentimentality. Not necessarily a bad thing, and surely not as heinous a crime as his detractors would have us believe. Doinel's story is his story; Truffaut is himself maturing, and perhaps more than his alter ego, has gained a sense of responsibility. He's simply moved on. Image Transfer Review: Fox Lorber has treated this installment kindly as well. Colors are organic if a bit subdued in this 1.66:1 OAR transfer. There are occasional flecks present, but they are kept to a minimum and far from distracting. The digital process preserves the natural grain and texture of the film. Audio Transfer Review: The French mono is serviceable for this type of vehicle. There is a little hiss in exterior scenes but dialogue is always discernable. Nothing exciting, but fine overall. Extras Review: As with the others in this series, a pathetic 6 chapter stops dissect this film. Ridiculous. Filmographies are include for L�aud, Jade and Truffaut. Additional production credits fill two screens. The François Truffaut Collection includes a slew of trailers on every disc, all presented in widescreen format: The 400 Blows (Les Quatre cents coups), Two English Girls (Les Deux anglaises et le continent), The Last Metro (Le denier métro), The Woman Next Door (La Femme d'à côté), Confidentially Yours (Vivement dimanche! ), Stolen Kisses (Basiers volés), The Soft Skin (La Peau douce), Bed & Board (Domicile conjugal) and Love on the Run (L'Amour en fuite).Additionally, there is a sentimental Tribute to Jean-Pierre Léaud that runs 02m:23s and shows clips of the actor from the various Truffaut films in which he's appeared. 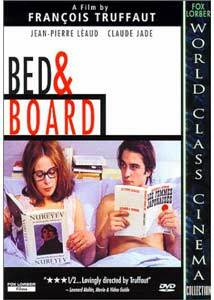 The fourth in the mostly autobiographical series that follows the restless Antoine Doinel into maturity, Domicile conjugal (Bed & Board) is an entertaining romp, treated well by Fox Lorber. Well worth a watch if you've followed the story until now.